Frank and I were invited by our long-time friends, Norman and Phyllis, to visit them in Raleigh, North Carolina. There was a guest speaker coming to the local BMW dealership they thought we might enjoy seeing while there and, were they ever right! Rene Cormier, Canadian motorcyclist, traveler, adventurer, and author of The University of Gravel Roads was there sharing the story of his four year, $25 a day budgeted, 155,000 kilometer motorcycle trip around the World. Yes, around the World! Needless to say, this was right down our alley. When we arrived at Capitol BMW located 4209 Atlantic Avenue, Raleigh, North Carolina around 6 pm the place was a buzz. They were serving hotdogs, hamburgers, beer and wine, all of which was very delicious – especially the wine. Kudos to Capitol for their Ferrari-Carano Chardonnay selection. One of my favorites! I was instantly drawn to a girl wearing a vest with TEXAS scrawled across the front. That’s what I call an icebreaker opportunity. My new found friend was Natalie, a local from Raleigh and BMW rider. Here’s a shout out to Natalie. Hey, Natalie! 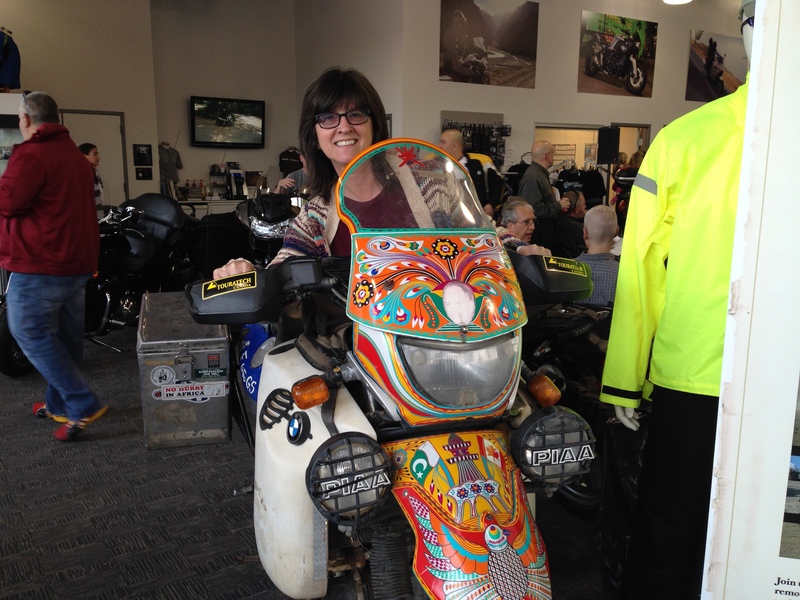 She and I had a great time talking about our love for riding, differences in motorcycles and gear. You know, shop talk amongst like-minded people. And we were both greatly anticipating hearing Rene talk about his trip. Capitol BMW moved most of their bike inventory outside and set up folding chairs and a large video screen inside for the event. The atmosphere was electric-the place was packed. Rene spent about an hour and a half taking us through, step-by-step, his planning and the execution of this long once-in-a-lifetime adventure. 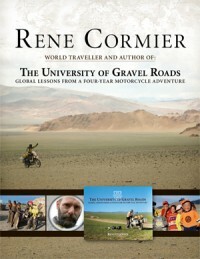 His book titled, The University of Gravel Roads, tells the story, and Rene holds nothing back. 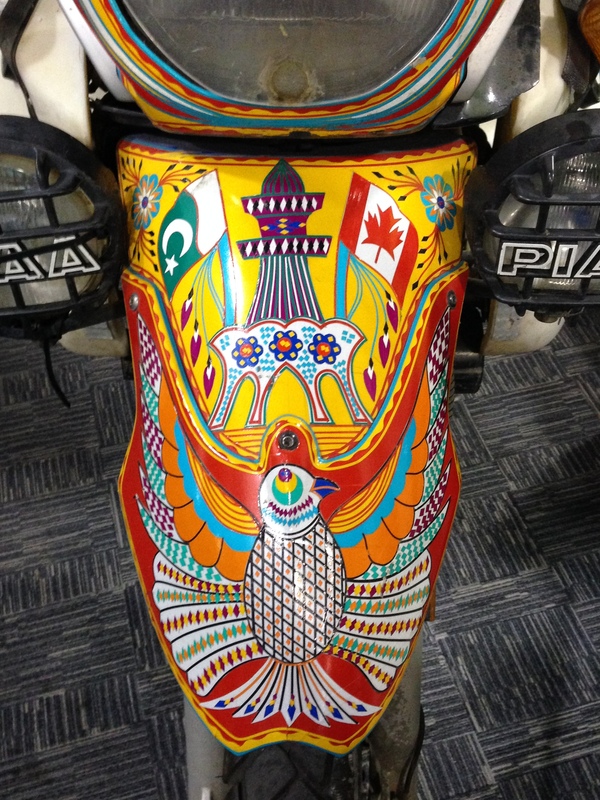 Here pictured below is a close up of the front fender of Rene’s BMW F650GS which was decorated in Pakistan. That is not paint, but hand cut and designed adhesive strips. 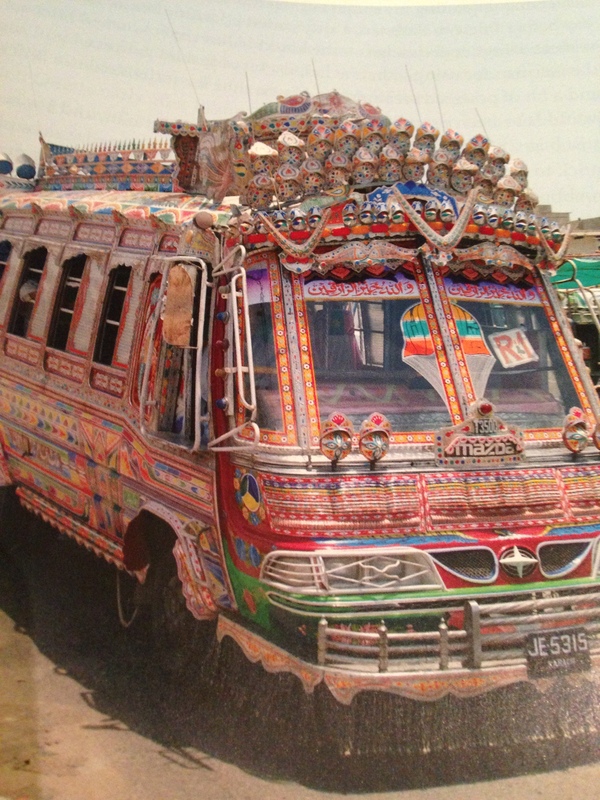 Rene was inspired to decorate his bike like this after seeing all of the colorfully decorated vehicles driving round the city. I think I might have done the same thing! So get out there and ride. What are you waiting for! I send a special thanks to our friends Norman and Phyllis for inviting us into their home and sharing the evening with their friends at Capitol BMW. 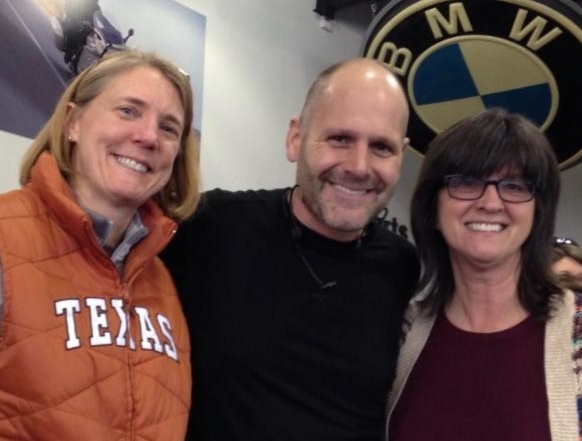 For those of you interested, Rene Cormier will be speaking in San Antonio and Boerne, Texas April 15 at Alamo BMW You will find that he’s an excellent storyteller. His adventure is fascinating and his photos are incredible. You’ll love it and … maybe I’ll see you there. This entry was posted in Blog, On The Road Again and tagged biker travel, biker trip, BMW F650GS, BMW travel, Canadian biker, Capitol BMW, epic motorcycle trip, motorcycle travel, Rene Cormier, The University of Gravel Roads, trip around the world, world travel on motorcycle. Bookmark the permalink.